A study of ancient Greek philosophy shows that music education was once inseparable from the philosophy of science. Intervals of astronomical space were represented symbolically by the whole number intervals of musical harmony. The distance from the Sun to Mercury was compared to the distance from Mercury to Venus, Venus to Earth, Earth to Mars, Mars to Jupiter, and Jupiter to Saturn. Astronomers discovered that this sequence followed an elegant mathematical formula that could be applied to the length of a musical string to produce a sequence of notes. These “astromusik” intervals have been highly influential in the creation of Western Music theory, from which instruments like the piano and guitar were derived. The macrocosmic astronomical influence on music is well documented whereas the role of microcosmic notions of atomic elemental and chemical compounds in music theory are rarely addressed. 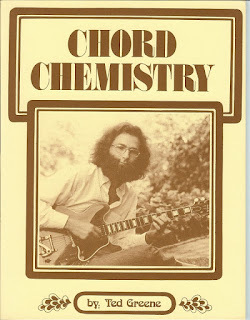 Above is an image of Ted Greene’s music theory book called Chord Chemsitry. His book is fundamentally musical and has very little to do with esoteric musical cosmology. Nevertheless, the title makes an important point; there is a science to the way chords are formed and fit together within the art of music composition. 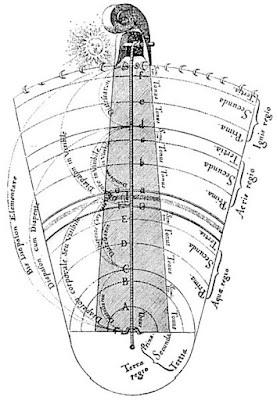 Goethe wrote that “architecture is frozen music” because the geometric proportions that inform musical harmony are also fundamental to the creation of sound architectural design. How interesting that the word “sound” is synonymous with words like reliable, strong, and trustworthy. The inverse of Goethe’s statement is equally true; music is floating fluid architecture. I return frequently to the relationship between fluid sound waves (tones) and their pictographic representation as solid items on a musical staff (notes). As if by magic, tones are symbolically turned to stone and they become seemingly solid notes. Depending on how you view a tone, it could appear as a wave frequency (measured in hertz / cycles per second) or as a note (measured in pitch values on the chromatic scale). Knowledge of wave-particle dualism surfaces in the world of physics and quantum mechanics. The notion that photons will behave as both waves and particles, depending on how they are viewed by the observer, applies metaphorically to audio production. 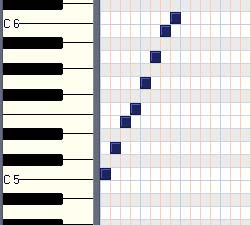 A midi piano roll may sound the same as its representation as sound waves, yet they look completely different. Each map (midi vs soundwave) can be edited to produce different types of effects in the overall composition. Musical notes in the Western tradition are very closely related to elements on the periodic table. Each row on the periodic table is called a “period”. There are seven periods in total. Element 88 on the table is called Radium, which is followed by a series of radioactive elements called Actinoids. There are 88 keys on a piano that span just over seven octaves. Each octave is composed of eight notes (do – re – mi – fa – so – la – ti – do). If you take a look at the second and third rows of the periodic table there are eight elements, based on John Newland’s chemical theory of octaves proposed in 1866. 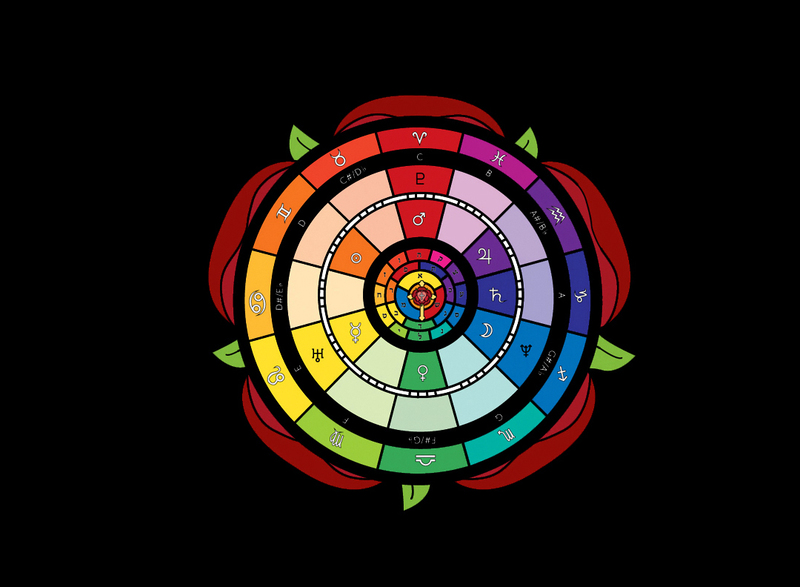 This law of octaves is derived from the fact that eight electrons can fit within the second and third orbital of an atom, just as eight musical notes fit within the diatonic scale of an sonic octave. 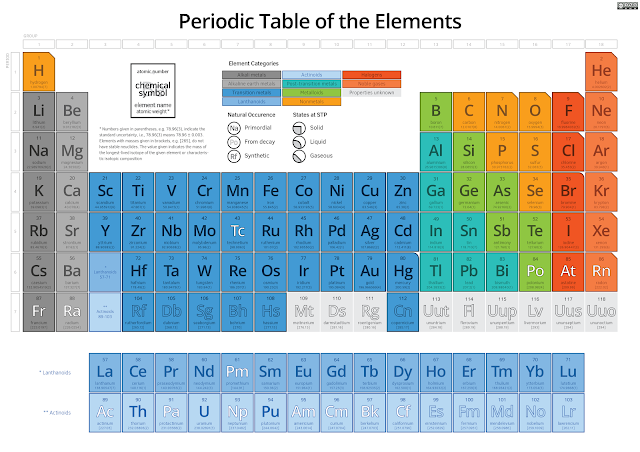 In theory a person could map the 88 notes of the piano onto the first 88 elements of the periodic table and compose music through a study of actual chemistry. A chemical compound is composed of numerous elements interlocking at precise bonding angles. I’ve chosen Dimethyl-Tryptamine as an example. The chemical has a known effect on human biochemistry that can be proven through empirical studies. It is composed of twelve Carbon, sixteen Hydrogen, and two Nitrogen atoms; C12H16N2. The low-to-high pitch frequency of a musical note is analogous to the electron density of a chemical element. 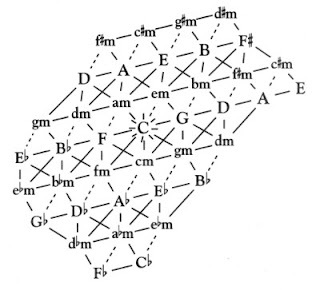 Musical chords are composed of note-elements, as shown above as collection of seven diatonic chords in the key of C Major. The linear piano keyboard model is several centuries old and has since been re-imagined as a beehive design, commonly found on accordions and less commonly on customized keyboards like the C-Thru keyboard shown below. The notes of a musical scale create chords which can also be arranged in geometric patterns that resemble chemical compounds. In this way a full song can be analyzed in terms of a two-dimensional geometric map of the progression where time is laid out spatially and sequentially, as shown below. It occurred to me recently that all musical scales amount to a selection of notes from the full chromatic pallet. Major minor and diminished scales are always composed of seven notes from the twelve available notes. This limited pallet has a close correlate to the relationship between light and chemistry. This is a C Major scale on a piano roll. Each of the notes in the scale are represented by a square. Notice that some of the rows are empty and some are occupied by a note. The selection and omission of notes defines the key signature of the scale. 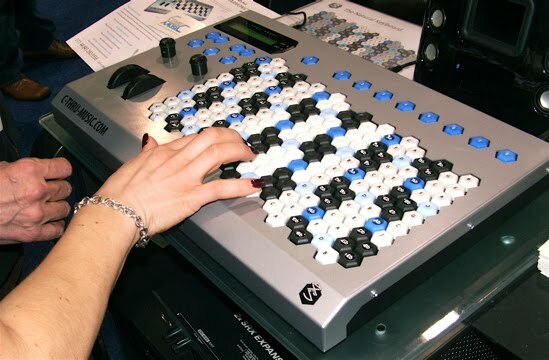 From this scale, a collection of seven basic chords can be created. These chords are created exclusively from the notes located within the scale. Spectroscopy is defined as the relationship between matter and electromagnetic radiation. Scientists make spectral measurements to detect the chemical makeup of a given element or compound. The image below shows how simple elements like Hydrogen, Helium, Lythium, Oxygen, Carbon, Nitrogen and Neon are represented as a scale, or series of demarcation points, along the light spectrum. Do you see the similarity to musical scales? Astronomers use spectrography to determine the predominant chemical fingerprints of planets and stars, as well as their position and trajectory relative to Earth. Spectroscopy (study of light’s relationship to matter) may prove to be an important analog to the impact of “chord chemistry” upon human neurochemistry. Scientists have coined the term psychoacoustics to describe their investigation into the psychological and physiological impact of melodies, chords, rhythm, and sonic textures. It seems to me that musical chord chemistry follows a deeply coded universal logic. The laws of vibration apply to light sound and matter, uniting macrocosmic celestial intervals of space with microcosmic biochemical operations. Previous Post Do Plants Have Memory?